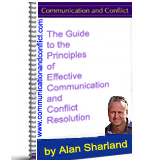 Communication and Conflict Newsletter, Issue 17 - What's Your Greatest Conflict Challenge? What is your personal greatest challenge in responding to conflict? What do you find most difficult to handle? First of all, my apologies that there was not a newsletter in June 2009. It was a busy month for many reasons and in the end I had to cancel the newsletter. Take a little time to consider the question? Are you aware of the times you have the greatest difficulty or have you never really stopped to consider it? Being aware of our responses to conflict is one of the most powerful steps we can take towards dealing with it effectively. This may seem obvious but usually our ineffective responses to conflict are simply 'reactions', that is, we don't really decide on our response as a result of considering options. The response is not a 'conscious' one, and this is often why we repeatedly experience similar types of conflict as we don't realise that our reaction has become habitual. If you keep doing what you've always done, you keep getting what you always got..... as the saying goes. So what were the responses to the Twitter survey? Dead ends and threats of violence. If they won't talk, what can we do? a good faith attempt to resolve blowing up in my face! I find some of the most difficult cases are the highly emotional, highly positional ones. What is your personal greatest challenge in responding to conflict? What do you find most difficult to handle? 2. Some responded with examples of the kind of behaviour or the 'kind of people' they find difficult. I would say dealing with expert/old managers, whats your suggestion? People with stubborn attitude, they never convinced with what you say or suggest. People that won't take accountability for their actions and/or words. Pride is such a big barrier. Taking the lowest seat in the room & not the highest-we tend to do the latter. Ppl who only say I don't know to everything or who stop listening instantly,when you say something. In responding to conflict, the only challenge I find difficult to handle is indifference. Dismissive, disrespectful, manipulative communication, in other words lack thereof. I think inner conflict is the most damaging/challenging. I deal with it by trying to make myself realize that there is TIME. remembering to act consciously and wisely instead of reacting!! asking the question rather than jumping in but I'm getting better at it! I guess one of the main observations I would make about the responses is that it confirms that none of us have the same difficulties with conflict. We all have different responses to, and experiences of, conflict and so generalising about what constitutes 'difficult behaviour', and particularly 'difficult people' is impossible. Most of us have excellent ways of responding to conflict and we do it well throughout each day. So well we don't even think about it. But when those reactions don't work with a particular person's behaviour or a difficult situation, our consciousness has to be awakened if we are to find a constructive way forward. We have to make a new choice about how we respond as our trusted 'one size fits all' reaction ...... doesn't fit any more! But sometimes we think there is no choice and that is when we get stuck. The point is we have to create a new response. I recently came across the above quotation, on Twitter in fact, and I was stunned by the revelation it caused in me. It brought much of what I see and work with as a mediator and conflict coach, and as a human being, into focus. I have, for some time now, considered conflict as something that is inevitable rather than something that can be 'stopped' or 'avoided', but M.Esther Harding's statement describing it as the beginning of consciousness brought many of my thoughts about comnflict together for me. Conflict as an opportunity, an awakening - any other way is trying to resist the inevitable, which is why we find it so tiring and stressful, and impossible, if we try to deny or fight against its presence. When we are 'loving what is' as Byron Katie would say, we can be open to what conflict has to offer. We often hear people say that they have a fear of conflict and do anything to ‘avoid’ it. It is impossible to avoid conflict and the fear that people talk about is of the imagined destructive responses to it rather than the conflict itself. When our repertoire of responses is limited and they don’t work, then it is understandable that we might fear conflict as we see it as the start of an escalating sequence of behaviours that can include anything from verbal abuse to extreme violence to ‘the silent treatment’ and emotional blackmail. But this is unfair on conflict. We are responsible for whether conflict leads to learning and greater closeness and rapport or whether it leads to war. Conflict just is - whether we choose the latter or the former for our response. All the time we say conflict is the problem it means we are not taking responsibility for our responses to it. We are not acknowledging our ability to respond constructively - our response-ability in the face of conflict. We disempower ourselves. No-one does it to us. Recognition of our capacity to create more effective responses enables us to lose our fear of conflict or need to avoid it. Many of us never consider that there may be a better way of responding to our conflicts and so we become reliant on others to 'change'. This is a hopeless aim. Instead we can learn to embrace conflict and treat it as an opportunity for growth, learning, greater rapport with others. Conflict can become a doorway to enrichment of our lives - the beginning of consciousness. If you have Skype and would like to arrange a consultation, please go to the Skype Consultation page to send me details of what you would like to discuss and proposed times to call me.